Our first night in Breckenridge was christened by visiting a karaoke bar. The altitude didn't effect Kenton's lungs enough to prevent him from embarrassing me. He brought down the house with his rendition of "Use Somebody" and Huey Lewis', "The Power of Love." There were many other great performances from brothers and cousins. And…. I may have been forced to sing, "Total Eclipse of the Heart." Maybe. We woke to a beautiful cool morning. The gourmet food was flowing, but I set out for my first acclimation run. I felt like a slug, but took in the incredible view. We've refused to use our car while were here. So we rode up to the brewery to meet our family for lunch. I had an amazing ahi tuna spinach salad. That should be a great pre-race lunch! 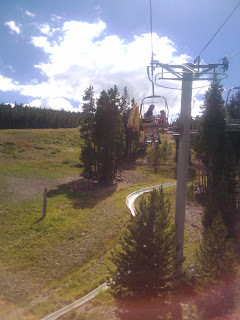 After lunch we rode the gondola to the slopes and rode the lifts up to the top off the alpine slides. We rode once and got stuck behind a slow rider. The powers that be let us have a do-over. We were stoked and planned to fly as fast as possible. I rode with Judah and Kenton gave me his iPhone to take a video. Kenton & Judah go alpine sliding from Kenton & Lacy Hansen on Vimeo. Kenton took off before us and then we pushed the speed on our turn. Well, apparently the speed was too much. We flipped on a turn. My mama bear instincts kicked in. I cradled Judah in one arm, protecting him from getting burned down the concrete slide. My tech/nerd wifing instincts kicked in too. I held Kenton's iPhone up with the other hand. I covered the essentials. The baby and the phone survived with minimal scratches! 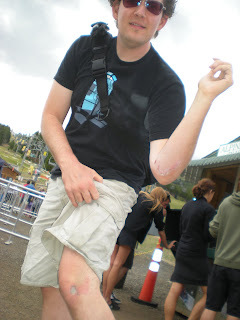 I on the other hand tore through my shirt, tore open my elbow, and tore up my knee and leg. We jumped back on as quick as possible to make sure the next rider didn't slam into us. Judah was a little gun shy, but we made it to the bottom expecting to show off our wounds to Kenton. However, he had crashed just as hard if not harder. His arms and legs were all torn up too. Lacy & Judah Crash from Kenton & Lacy Hansen on Vimeo. So, our free ride ended up coming at a price after all. Good times though. We told Judah that even though it hurt and it was scary, we'll come back tomorrow for more. I picked up my bib number for the race in the morning and got my shirt. 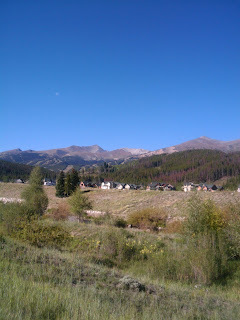 It's called the Breck Crest Marathon. I'm only running the half. It's going to tough enough for me at this altitude, then I saw how high we're going in addition. Awesome. Going to have a good dinner and a good night's sleep. Here's to God's favor in the morning! 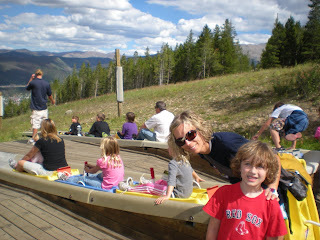 I had never heard of the alpine slides before another blogger wrote about them a couple of months ago. 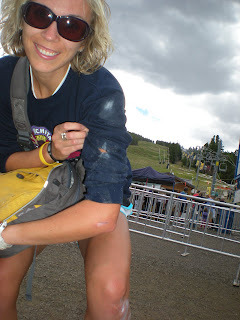 She crashed too, and left a fair amount of her skin behind…the wounds were quite nasty! I think they look awesome, and I'd love to do it sometime. Perhaps in protective clothing for motorcyclists? Just want to say I have never crashed on an alpine slide. Just thrown' it out there. Not sure about the Alpine slides. Looks fun though, if you don't crash. Have fun on your Half!! gorgeous photos!!! the area and you + your fam. looks like a great getaway!!! 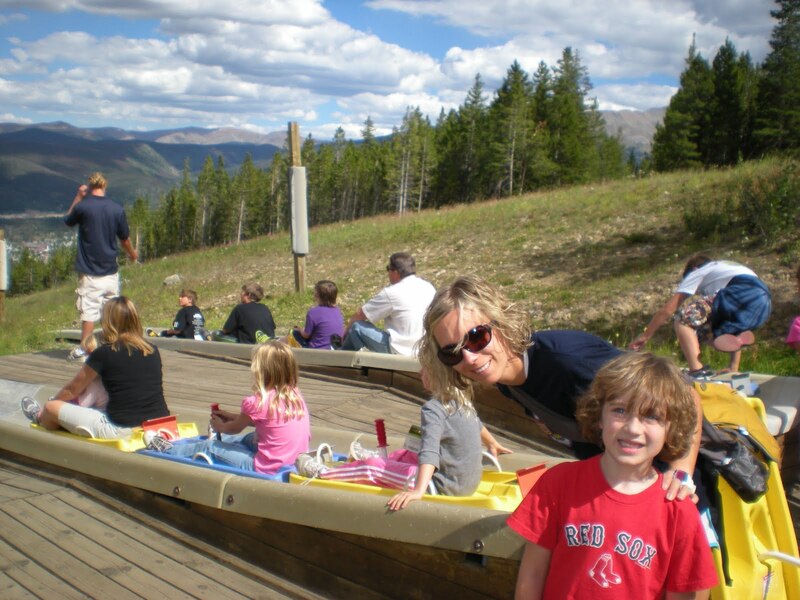 i am so jealous, i love colorado, especially this time of year..that alpine slide looks fun (except for the crash part)…and what, no video of "total eclipse…"